Christmas is a great time of year but can be a very stressful few weeks for some. There is a huge amount of pressure on people regarding money in the form of presents, parties and feasts to be prepared. After nearly a year away travelling, I’m almost broke and don’t have the money for presents. This year instead I’m giving my time to others – by simply calling in to catch-up with friends, making a cake or some treats, inviting a gang over for food or deliver one of my homemade gifts to someone special in my life. Here are some of my favourite things to make and give to others. 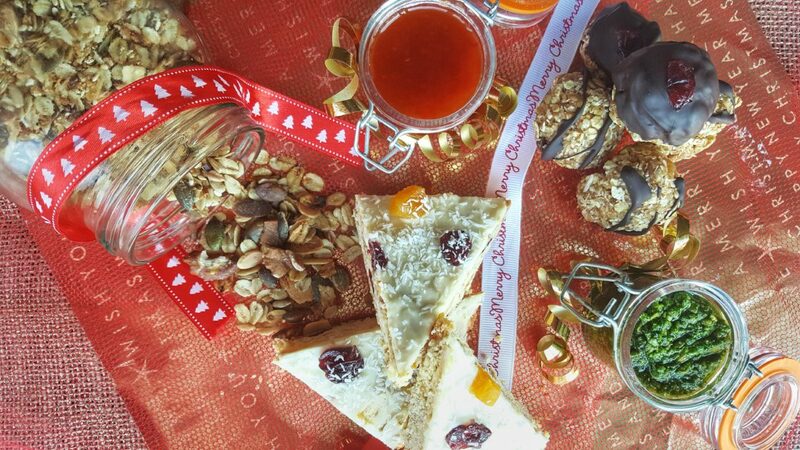 So, if you are stuck for a gift for someone with limited money why not try one of these recipes? You will probably have half the ingredients in the cupboard already and the remainder will cost less than €5. But it’s not about the cost, it’s about the love and time you put into creating this unique gift just for your chosen person. Sticking to a food or fitness routine can be difficult at Christmas. Check out my top tips that featured this week on the WellFest blog. Granola – Save the cooking for later in the day and start Christmas morning by munching on granola with some yoghurt and fresh fruit. Homemade granola is a great gift as it will keep fresh for ages in a jar. Fill the biggest jar you have at home with granola, tie a ribbon and tag on it and another present is off your shopping list. Add a little more Christmas to the granola by adding some cinnamon or all spice, dried cranberries or apricots or some fresh orange juice to the oil. Sweet Chilli Sauce – This is such a versatile sauce that is literally made in minutes. If your friend likes a little or a lot of spice you can tailor the sauce to their needs. This sauce will keep fresh for 3 months once stored in a cool place. White Chocolate & Cranberry Oat Slices – Christmas is all about a little bit of decadence and these white chocolate oat slices are just that. Pop a few slices into a bag, tie with ribbon and you instantly have a fancy homemade gift ready for any unannounced visitors or last minute gifts. Homemade Pesto – I don’t think I’ve met a person yet who doesn’t like pesto! All you need is a bit of elbow grease (food processor, coffee grinder or pestle and mortar will also work well), herbs (coriander, basil, nettles), seeds or nuts (pumpkin, sunflower, almonds, cashews, pine nuts), garlic, olive oil, lemon juice and some parmesan. Keep fresh in the fridge for at least 1 month once covered in oil. Dark Chocolate Oat Truffles – If you’re shopping for a health conscious minded person or a lover of energy balls then look no further! You will have these chocolatey oat truffles ready in minutes. No need for gift wrap just pop the truffles into a jar or resealable bag, add a little ribbon and their edible healthy food gift is ready. Spiced Apple & Ginger Chutney – Chutney is a staple in many houses and often pulled down from a shelf or out of the fridge to help make a cheese board look a bit fancy! I love to preserve fruit and vegetables by making jams, jellies, pestos and pickles. Chutney is another great preservation method and the steps are too easy to follow. This Apple & Ginger recipe will stay fresh for one year once stored in a cool, dark place.